Advertising is used everywhere, on billboards and posters cluttering our visual landscape with messages to buy this or that. What if public space was used to convey an idea instead of a brand? What if advertising was used to inspire thought instead of encourage mindless consumption? For many years I thought everyone agreed that education was a good thing, but then I considered just how profitable it can be for some businesses if everyone remains ignorant. The internet is changing this sad truth and with the advent of social networks, people can share endless information about everything from politics to environmental or social issues. But what about public space, how can that be reclaimed transformed? Recently I watched “Exit Through The Gift Shop“, which I highly recommend to anyone who hasn’t seen it. It’s about street art, reclaiming public space with creative and thought-provoking expression and it features Banksy, Shephard Fairey, Invader and many of the world’s most infamous underground artists. From cave drawings to urban graffiti, images and words shape the way we perceive the world yet the paradigm of competition and consumption continues to rule the visual landscape of the modern world. Some argue that is human nature, but it isn’t exactly true. Humanity evolved from cooperation as much as it did from competition. Tribes, bands, communities have been the support network that has raised generations of people in cooperation. Even wars between tribes or nations showed much cooperation in each individual side as they fought the enemy. Where do we see messages of cooperation, of compassion, of inspiration in public spaces? The life of a street artist might be a little too daring for the average person, but there are ways that artists find their own ways to inspire the community around them. Jeff Daverman of Root Concepts is one of them. He has made a successful business giving people a voice in public space with ideas that inspire. I had the opportunity to visit Jeff in his studio and see his philosophy in action. You’ve probably seen his stickers on Prius’s, hippie vans, in health food stores, street light posts, bikes, kids lunch-boxes sand yoga studios. Jeff has the inspired notion to use stickers as a way to encourage dialogue, to make people think and to dream. Like many artists, and primarily street artists, Jeff understands that there is a battle of ideas occurring in public spaces. Another thing his stickers do is remind us of the words and lives of social justice heroes, encouraging us to reach our highest potential. Whenever I see his stickers around I am reminded that I am not the only one who dreams of something better. 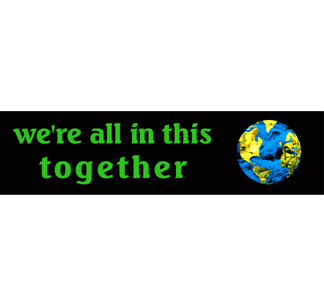 I am reminded that there is still a huge community of people who believe in cooperation, in working together and dreaming bigger for the sake of our future and our planet. When you watch this video, I’m sure you will recognize the work of an artist who has left his fingerprints all over the country.